This year I feel a little bit different about Christmas. No, I haven’t exactly found the spirit of Christmas in my heart or anything like that. The feeling I’m feeling comes from a funny, unsubstantiated thought squatting in the back of my head at the base of my skull. The odd irrational thought is that this may be my last Christmas. No, I’m not expecting to die. I’m suspecting that Christmas is about to die. I think that in the next few years a lot of things that all of us expect and take for granted are going to pass away, never to be seen again by any of us. If that happens, then Christmas as we know it will be one of those things. At least I hope so. Enough of that. I want to tell you about Sinterklaas and Zwarte Piet. That’s the Dutch Saint Nicholas, the patron saint of old New Amsterdam (that is, old New York) who is said to be the origin of the modern American Santa Claus. He is always accompanied by Zwarte Piet or “Black Pete” his black African slave, a demon compelled to do manual tasks for his master. 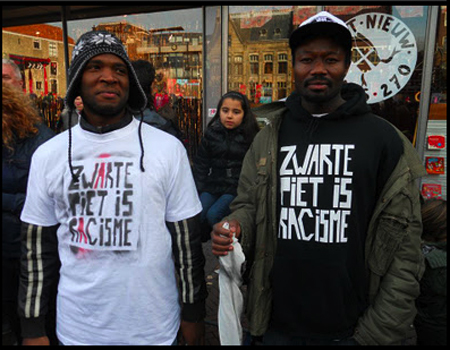 Back in Holland the Catholic saint and his black slave are still very much alive. 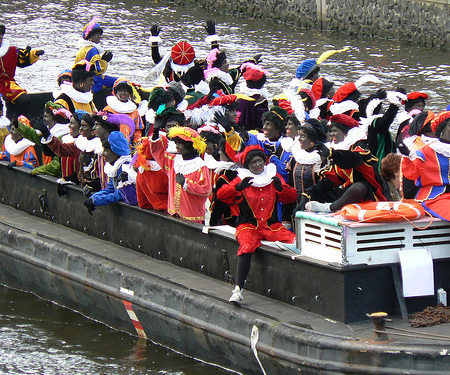 The celebrations begin every November with the arrival by boat of the pair from Spain of all places. 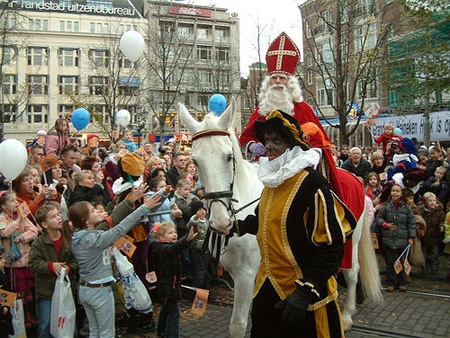 The master parades through the towns and cities of Holland on a white horse while the slave obediently walks beside the horse handing out valencia oranges to the children. There can only be one Sinterklaas for each of these parades, a fellow with a long white beard dressed in ecclesiastic robes, a bishop’s miter and an elaborate staff. But there are often multiple Piets in these parades. It seems that there are usually plenty of folks ready to cosplay the demon slave by putting on black face and a frizzy wig. Finally on Saint Nicholas Day, November 6 in Western Europe, the pair are said to visit each house in Holland to deliver presents. The Saint sits outside in his sleigh while the lowborn black demon slave climbs up to the roof of the house and drops down the chimney to deliver the loot. Then the underclass manual laborer climbs back up the chimney and trots behind the sleigh to the next house to deliver more presents. In old Dutch Beverwick (the original name of Albany, NY in the 1600s, for those who don’t know local history) the probable annual arrival of the saint and his slave would have been a cause for enthusiastic celebration. Records are sketchy, but along with references to the public celebration indirect evidence survives such as big bakery orders for the holiday. The large Dutch Catholic community in Beverwick considered Sinterklass their patron. 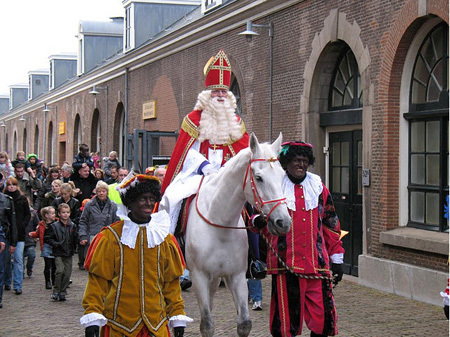 There is argument among the scholars whether Sinterklass and Zwarte Piet ever visited Beverwick for December festivities. I’ll have to say that I like the idea of the bishop with the long white beard arriving by the Hudson river in a Dutch caravelle like the Halfmoon. The white saint and his black slave would have landed at a wharf in what is now the South End, where the old Dutch fort sat on the flood plain. When the English conquered the colony of New Amsterdam they frowned upon public celebration of the feast of Sinterklaas, apparently for both political and for religious reasons. But the English wanted no trouble from their new acquisition, so in the Articles of Capitulation of 1664 they granted the conquered population religious freedom as long as they kept it low key and private. 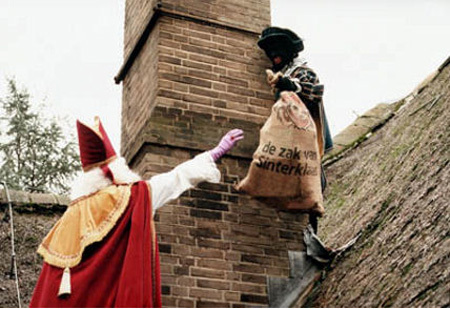 Dutch homes in and around Albany continued the Sinterklaas and Zwarte Piet traditions which eventually began to fade away. During the English occupation of New York public celebration of Christmas almost disappeared, and in some of the 13 Colonies public celebration of he holiday was outlawed. The reason was that back in medievel England Christmas was the day that the lower classes would show up at the manor houses of the aristocrats and demand “wassail,” that is, sweets and booze. The resident aristocrats would provide in exchange for a song, which is the origin of Christmas carols. It was the one day that the social order turned upside down. Then for the other 364 days of the year the peasants would obediently work like animals for their owners and slowly starve. But life was good because they got one day off got to go inside the manor house. But by the 1600s the holiday had degenerated into a wild and often violent party (a sort of precursor to New Year’s eve.) Respect for the old feudal caste system was gone and the Christmas holidays had become a time for spontaneous underclass rebellion, i.e. pointless riots. The upper classes had every reason to feel threatened by all the carrying on, their orderly world truly turned upside down. But Christmas did not die. By the early 1800s the upper classes of Western Europe had begun a practice of observing Christmas as a family holiday surrounded by a set of brand new “old fashioned traditions.” During this time some of the young aristocrats of New York City proposed bringing this new genteel version of Christmas to the US. This was part of a larger effort to establish a European style feudal social order in the US, an effort that aristocrats are continuing in earnest to this day. These NY aristocrats put out some very effective propaganda, notably Washington Irving’s “Sketchbook” of 1819, a still popular depiction of a fantasy Christmas in England where all the economic classes celebrate the holiday together in harmony, each in his own place. This, as Irving pointed out, was in contrast to the ever increasingly violent class confrontations of early industrial America. Also notable for the development of the modern Santa Claus and the attendant “traditions” is Irving’s lesser known political satire “Knickerbocker’s History of New York” of 1809. And of course there was Charles Clement Moore’s “The Night Before Christmas” of 1823, which was first published in Troy, NY. These books draw heavily on the image and traditions that were still surviving of the old Dutch Sinterklass, celebration of which by their time had become confined to a few upper class Dutch manor houses. Thus these “homegrown traditions” leftover from the Dutch served as a ready justification for bringing the new genteel European Christmas across the Atlantic. But what happened to Zwarte Piet? Irving and Moore carefully excised Santa’s Black Slave from the new ancient legends. In pre-Civil War America slavery was a divisive issue that nice people avoided during polite gatherings such as Christmas, like today the way one avoids mentioning Abortion or Gay Marriage when your crazy Dittohead uncle comes to visit. The new improved Santa Claus not only lost his helper, the generous saint actually assumed manual tasks such as climbing down the chimney. 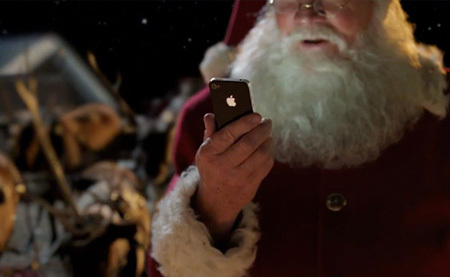 Irving and Moore thought it best to depict the New Saint Nick implausibly as working alone, possible because a “magical elf” does not need to use a servant. But think about it. What sort of person could these propagandizing authors have used as a successful substitute for Black Pete? A liveried butler? An Irish laborer? A washerwoman? The mere existence of a master and servant would have instantly suggested class relationships to Americans. And as we all know, Americans absolutely do not like to think about or discuss class and class conflicts at all. In fact, I’ve found that the typical Baby Boomer of today often insists that class as a concept does not exist and anyone who discusses economic disparity is a terrorist. So Christmas became a classless holiday. The new cleaner Christmas fantasy appealed to Americans on an instinctive level and almost instantly became regarded as ancient and traditional. By the end of the 1800s this new Christmas had become widely popular. But something essential was lost with the eviction of Black Pete from the Christmas myths. Yes, the character is offensive, for white Europeans to suggest that black Africans are little more than demons that need to be enslaved for their own good, well, that don’t work no more. Obviously Black Pete is not the kind of primal role model that we want to present to our children. But consider that Dutch Black Pete has a relative next door in Germany and Austria, Grus Vom Krampus the anti-Santa who punishes bad children. 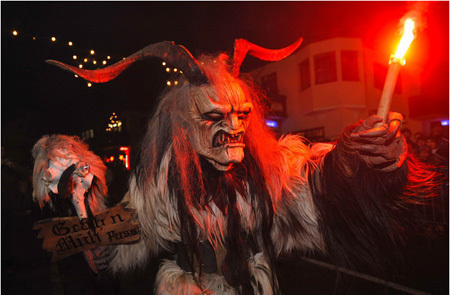 His day is December 6 which is still called Krampusnacht, a pre-Christian festival that paid homage to the child-stealing demon of winter. On that day he comes to collect all the naughty children, which he then beats and tears apart with his claws, then transports the bits of flesh to the underworld for dinner. It’s probably no accident that Krampusnacht is the same day as Saint Nicholas Day, indeed Saint Nick and Krampus arrive at German household celebrations together on that day to scare and please the children in turn. Each has his own job to do, Saint Nick rewards the good children and Krampus snatches the bad (or pretends to.) Neither interferes with the other’s duties and neither has control over the other. 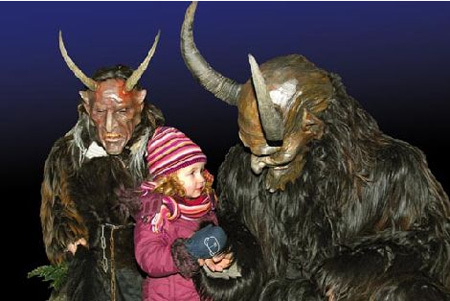 Despite a heavy German influence early in our country’s history, Krampus never caught on even for a moment. I think it interesting that Americans who love to watch authoritarians pump bullets into scapegoats accompanied by car wrecks and explosions could not stand even a hint of moralistic violence in their year end holiday. Christmas is an escape from cold reality, the world turned upside down for a day, and for us Americans today that means a day at home without economic classes or violence. This German duo appears to be derived from the dualistic pre-Christian high god Woden (or Odin) to whom peasants gave thanks for their harvests. 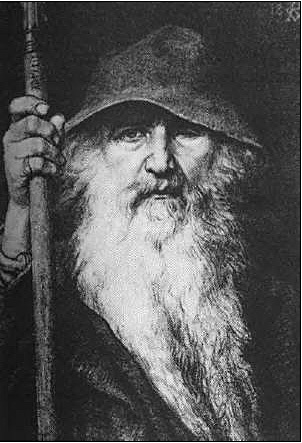 At the same time Woden was the one who carried souls to the underworld, “The Traveler.” Woden encapsulated the random events of the universe, he was as likely provide for your children’s health and wealth as he was likely to suddenly spirit your precious child away to the land of the dead. One of the central myths about Woden is how he hung on a gallows for nine days and was pierced in his side by a spear. He then gave up his left eye to attain universal knowledge. No doubt the rural pagans of Germany noticed the similarity to the Jesus myth, who only hung for three days, was also pierced in the side by a spear and then attained godhood. And Jesus didn’t have to lose an eye. Leave it to the German Catholics to surreptitiously preserve the old religion during the Christian interregnum. That includes trappings such as decorated trees, mistletoe, and all that other stuff that the Protestants decry as pagan. The rural folk even managed to preserve their highest deity, albeit divided in two and watered down to a story for children. Thus the young NYC aristocrats of the early 1800s hacked apart the old high god Woden and discarded his darker parts altogether. Woden became a genteel aristocrat who provides material goods to the worthy. Santa is, as was said of Woden, magical. He is “self made,” a fat jolly successful elderly businessman who can afford to be occasionally generous with his wealth. This is hardly the first time that a group of persons have created a god in their own self image. Like the Wall Street aristocrats of today, the One Percent of 200 years ago lived off the backs of the underclass but believed that they owed the rest of society nothing in return. The world exists simply for their pleasure, and the god Santa will reward them with nice things because they are the right sort of people. For the first half of the 1800s this new genteel Saint Nick was worshipped mostly by exclusive households in New York City. But as we all know, the poor ape the mannerisms of the rich. Therefore in the decades after the Civil War, this safe for the family Christmas caught on first among the then rising independent middle class, and later was enthusiastically adopted by the lower classes. By the mid 20th Century after World War Two, this manufactured Christmas had frozen into an allegedly ancient set of traditions and rituals that no one ever questioned. 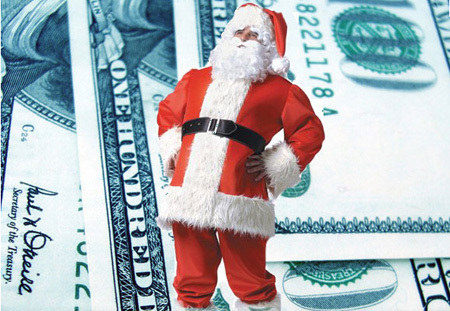 During this time of unprecedented wealth and expansion of the middle class (thanks to the New Deal of Franklin Roosevelt) the celebration of Christmas became, as was commonly said at the time, “increasingly commercial.” That is, the obligatory rituals of Christmas began to be openly exploited by retailers and charities. Corporate TV Ad, 2011: Would Woden Have Put Up With This? Eventually the commercialism of Christmas became so bad that fleecing the rubes turned into the main focus of the holiday. By the 1980s international corporations had taken control of the US economy. Random commercialism by small and medium sized businesses was replaced with systematic exploitation by the corporations. By the end of the 20th Century the Christmas holiday had degenerated into an obligatory consumer spending event. You are required to shop. The selling of small luxury items to benefit the parasitic corporate economy has become the one and only reason for Christmas. Captured and raped by corporations, the genteel year end family holiday turned into the filthy degenerate scam operation that it is today. Besides required shopping, all that is left of Christmas today in the 21st Century is a few corny decorations and bad music leftover from a forgotten recent past. And of course, all that Christmas crap made in China is for sale. Perhaps Woden is getting his revenge for being sliced into two pieces and and having one part sent to the landfill. Or to put it another way, perhaps to deny the darkness and ignore the other half of the world is a lousy idea. Perhaps denial of reality leads to unfamiliarity with reality which leads to fear which leads to isolation which leads to insanity. Merry Christmas. Sooner or later the darkness catches up to everyone and the fantasies become unsustainable. That’s the reason, you see, that I think Santa Claus needs to bring back Black Pete as his companion. Yes, I’m serious. Only this time I’d like to make Black Pete an equal partner to Santa. Together the man of light and the man of dark can bring oranges and geegaws and sweetmeats to the children, dividing up the manual delivery tasks between them. As equals their class differences would disappear and working shoulder to shoulder on Christmas they could accomplish more good than ever before. The lesson for children would be that darkness and unfamiliar things are not scary, they just are. Another lesson would be that true happiness and prosperity need both light and dark to be sustainable. Another is that equal partners can accomplish much more good than an idle master with an unwilling servant. The City of Albany can take the lead. Every once in a while someone proposes that Albany revive the public Sinterklass traditions, arrival by boat and a parade, etc. Such an annual event prior to Christmas would attract tourists and put Albany on the year-end vacationer’s map. But the proposals dangle and get shelved because of Black Pete. No one knows how to handle him. Reviving the traditional Dutch Zwarte Piet would put Albany on the map all right. We’d become a mecca for white supremacists and righteous lawyers. But suppose Black Pete was a real black guy, perhaps a community leader who can play the part with dignity. 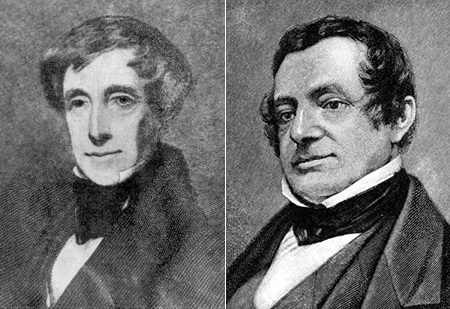 Imagine the pair side by side arriving on the Half Moon to disembark at... well, Albany would have to build a dock since we have none worth mentioning. 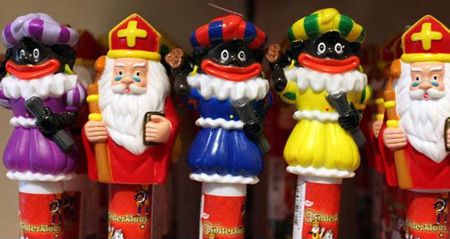 But everyone could see that Sinterklaas and Black Pete are equals who respect each other. That’s the kind of role models we ought to have for our children. The point behind this rant is that Christmas has been many things to many people and is whatever we want it to be. Some folks celebrate by getting loaded and destroying property, others like to hide in their houses and fawn over corporate geegaws. Some even go so far as to consider the pagan festival some sort of Christian event, or so I’ve been told. Seriously, some people do that. I see that there’s a lot of shopping this year, the malls are crowded and the suburban trunk roads are clogged all day long. I do not think that’s because “the economy is recovering” like the corporate media keeps babbling, it’s not. I’m not hearing that a lot of people have found good jobs, nor do I see ostentatious displays of plenty. I strongly suspect that this year’s holiday buying frenzy has been fueled by credit card corporations. This fall they quietly began offering more unsecured credit to average Americans because their share of the credit market has been shrinking alarmingly since the economic collapse in 2008. Perhaps what we are seeing this holiday season is an uptick in consumer debt, not an outpouring of wealth. Clearly people need that year end holiday as an antidote to the darkness of the Northern Hemisphere in December. That will probably always be so. But surely we can do better than this ugly distressing Corporate Christmas sustained by bogus traditions. We can make our holidays whatever we want them to be if we so choose. Notice how the "holiday" season starts in November, and people are adjusting their celebrations at home to correspond with the corporate calendar? 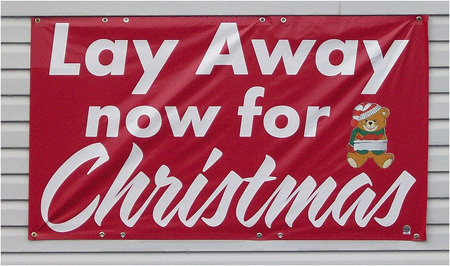 The media uses the euphemism "holiday" to refer to Christmas not out of respect for other beliefs, in my opinion, but because other religions may not celebrate Christmas but everyone can partake of "holiday", which is a material buying frenzy starting in November with Back Friday. Black Friday is celebrated with young men camping outside electronics stores to buy themselves new gadgets, while families stampede in discount stores, sometimes resulting in death. The corporate media made the switch with hardly anyone noticing. Thank You Dan For A Wonderful Expose!